During the last three to four decades an impressive body epigraphical material in Thailand, Laos, and adjacent Tai speaking areas has been surveyed, documented, and digitized. Though manuscripts and inscriptions may be considered “things of the past," there are still areas in the Tai world where they are still being produced. This panel seeks to explore the production, use, and transmission of manuscripts both as containers of traditional knowledge and as objects used in daily life, such as rituals and ceremonies. Special emphasis shall be given to the relationship between manuscripts and inscriptions, as both have influenced each other to a large degree. Research questions which might be explored in the panel could pertain to modernity in the living manuscript cultures of the Tai world. 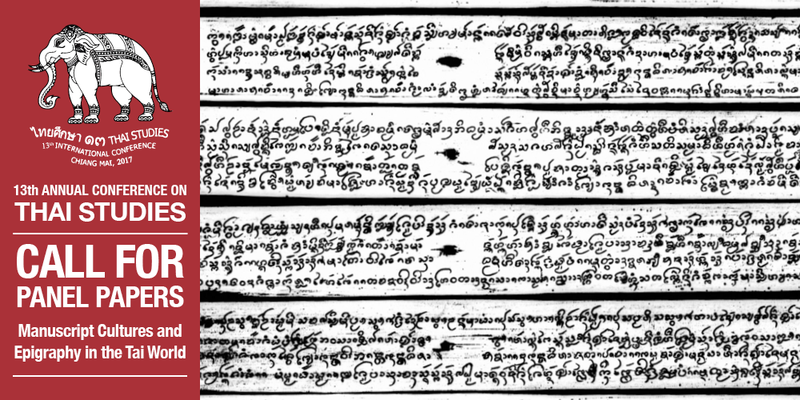 Is there a shift of writing support (eg, from palm-leaf to mulberry paper; from mulberry to industrial paper) and of scripts (eg, from various variants of Dhamma script to modern Thai and Lao) due to cultural and economic developments in the 20th and 21st centuries? How do these shifts affect the transmission of traditional knowledge—local wisdom, folktales, ritual texts, etc.? How do biscriptality, a typical feature of Tai manuscript cultures, and diglossia or multiglossia (i.e. the use of two or more dialects/languages) in one and the same manuscript reflect a multi-ethnic environment especially in the Upper Mekong and Salween Subregion? Another complex of research questions pertains to the preservation and storage of manuscripts. Here it would be helpful to investigate the different kinds of repositeries, ranging from diverse local repositeries (for instance, in Northern Thailand and Yunnan) to large international collections in the Western world. Finally, natural scientists are invited to present the contribution of scientific laboratories on the analysis of issues which are quite often beyond the ability of humanities (such as determining the origin of writing material and writing substance, the age of manuscripts and inscriptions, reconstruction of different layers of scripts, etc.). The now relatively easy access to these bodies of texts allows us to have a more comprehensive look at the chronological and synchronic development of the literature of the Tai world. What new lessons can be learned? Can we assess with greater accuracy the “weight” or social importance of some literary productions?